HBO will premiere a documentary titled "At the Heart of Gold: Inside the USA Gymnastics Scandal" about the Larry Nassar scandal on May 3. Take Back the Night, an annual day of events devoted to raise awareness of sexual violence and offer recovery resources, took place Thursday at Michigan State. A student-organized forum aimed to "Lift the Rock" on Michigan State's investments at Erickson Kiva Thursday afternoon, holding a discussion centered on transparency and accountability with MSU's finances. The East Lansing City Council doesn’t have a clear direction on handling recreational marijuana penalties after an April 16 discussion-only meeting regarding two visions of a potential ordinance. A tree was planted outside the MSU Museum honoring the sister survivors April 16. Watch some of the speeches here. This was part of a larger event with the opening of an exhibit at the museum. Michigan State’s Faculty Senate unanimously passed recommendations urging the MSU Board of Trustees to amend its policy on firing faculty members for-cause. Following the election of political science junior Mario Kakos as the Associated Students of Michigan State University (ASMSU) president, the 2019-20 session's General Assembly (GA) elected the rest of their Office of the President on April 18. The Associated Students of Michigan State University, or ASMSU, elected Mario Kakos to lead the 2019-20 session Wednesday night in a unanimous vote. Welcome to the April 15 edition of SNEWSCAST, where we take an in-depth look at The State News’ biggest stories, while bringing new perspectives from the reporters who wrote them. U.S. Sen. Gary Peters, D-Michigan, is set to hold a summit, titled “The Cost of Inaction: The Impacts of Climate Change and the Financial Burden on Taxpayers” at the Union April 22. A proposal from the developers of The Hub on Campus to build two student housing towers on Bogue Street faces delays as the city mulls an overhaul of East Village zoning laws. Several events — including the planting of a Survivors’ Tree, the placing of teal prayer flags and It’s On Us Week of Action — have taken place on MSU’s campus and around East Lansing as part of Sexual Assault Awareness Month. As the month goes on, there will be more community-wide commemorations intended to bring attention to survivors of sexual assault. A wall composed of 505 tiles — each representing a known survivor of Larry Nassar’s sexual abuse — is the first thing you will see if you walk into the Finding Our Voice: Sister Survivors Speak exhibit located in the main gallery of the MSU Museum. 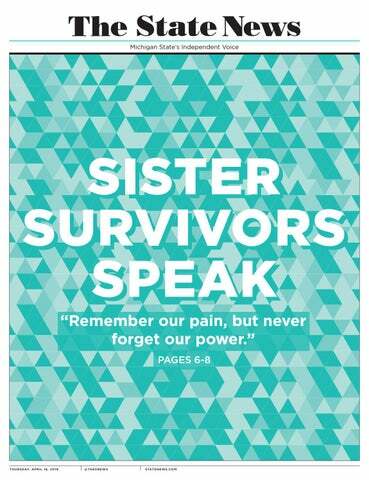 Some tiles are black and white photos of survivors at the age they were abused, while most are teal designs. Michigan State University police officers escorted two individuals out of Turning Point USA’s (TPUSA) "Campus Clash" event at MSU a mere three minutes after TPUSA founder Charlie Kirk came out to speak. The event took place at the Natural Science Building Tuesday evening. A time capsule and art exhibit rolled into one, the Finding Our Voice: Sister Survivors Speak exhibit opened April 16 in the MSU Museum. An opening ceremony welcomed members of the MSU community, survivors of Larry Nassar's abuse and their parents and Michigan politicians to hear speakers and walk through the teal exhibit. Two new witnesses were introduced during the fourth day of former Michigan State president Lou Anna K. Simon’s preliminary hearing Tuesday in Judge Julie Reincke’s Eaton County courtroom. Simon’s attorneys clashed with Reincke over the admissibility of many exhibits prepared by the prosecution, particularly those prepared for former Simon executive assistant Marti Howe. In the past year, Michigan State’s orientation program for new and incoming students has undergone a name change and restructuring. A panel of conservative commentators will speak at Michigan State Tuesday night as part of Turning Point USA's "Campus Clash Tour." The Beaumont Tower carillon bells will ring Tuesday in recognition of Sexual Assault Awareness Month.